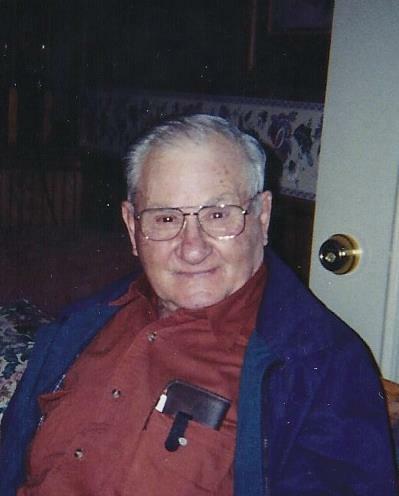 Paul Francis "Barney" Mouser Sr.
Paul Francis “Barney” Mouser Sr., 97, of New Haven, passed away Thursday April 11, 2019 at Sunrise Manor in Hodgenville. He was born February 23, 1922 in Seaborn, Iowa, a lifetime self-employed farmer, and worked with Bethlehem Academy Dairy, which was his father’s farm. He was an United States Marine Veteran of WW II, recognized as a KY Master Conservationist, he loved farming and the outdoors, and in his later years enjoyed mowing his lawn and loved his fresh farm food, especially tomatoes, and was of the Catholic faith. He was preceded in death by his wife, Anna Louise “Weasie” Davis Mouser; two sons, Joseph Wayne Mouser, and James Richard Mouser; three brothers, J.B. Mouser, Joe Eddie Mouser, and Johnnie Mouser; and three sisters, Alice Marie Mouser, Phoebe Williams, and Josephine Spalding. He is survived by his daughter, Patti Annette Mouser White of New Haven; two sons, Paul F. Mouser Jr. of Big Clifty, and William Adrian “Jack” Mouser of New Haven; grandson, Jason Mouser; great-grandchildren; and family friend, Donna. His Funeral Mass will be 11:00 am Monday April 15, 2019 at St. Ann Catholic Church in Howardstown, with burial in St. Ann Cemetery. Rev. Pablo Hernandez will officiate. Visitation will be 1 – 5 pm Sunday April 14 and 9 – 10 am Monday April 15 at Barlow Funeral Home. Memorial contributions may go to St. Ann Catholic Church.